TechScape Review 2019: Is TechScape a Good Hosting? Indonesian web hosting company TechScape was established in 1999. From data centers in Indonesia and the United States, it offers shared hosting and domain registration services targeted at small enterprises. 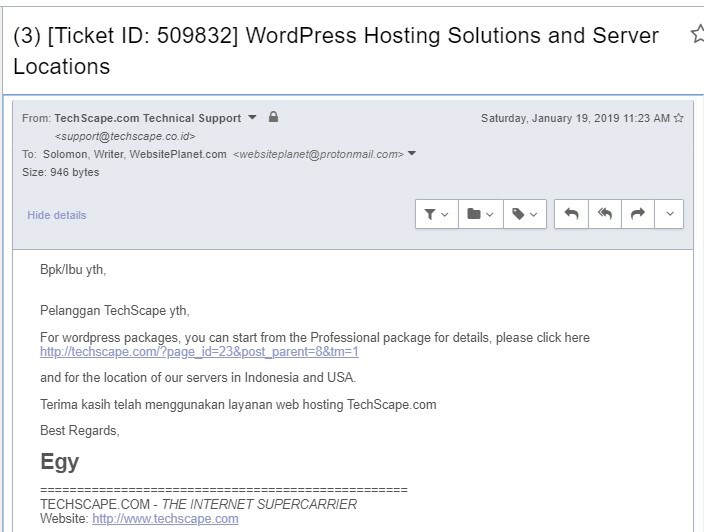 TechScape is a small Indonesian web hosting company that was founded in June 1999. It offers shared hosting services and domain registration solutions to individuals and small businesses, but not VPS or dedicated server solutions. The TechScape website is in Indonesian. TechScape uses servers powered by the latest technology to ensure the delivery of high-quality hosting services to its customers. The Unix operating system is underpinned by Hyper-Threading Technology that allows Intel Core processors to run multiple threads to improve the overall performance of the system. TechScape’s hosting packages include the basic Cyberstand package (with 1GB monthly data transfer and a mere 1MB disk space) and the premium Corporate package (with unlimited data transfer, SSH access, bandwidth of up to 10 Mbps, and unlimited emails). In addition, all packages include CGI, PHP, WAP, SSI, DHTML access, and email backup services. This vendor also has a backup plan just in case anything happens to its primary servers. It includes remote backups performed every day. However, in case of data loss, they can only restore the last backup that was taken and only up to a maximum of 5 GB data. TechScape’s hosting plans (priced in Indonesian rupiah) are well within the price range of other Indonesian hosting companies. Customers pay monthly. Negatively, there is no refund policy and no uptime guarantee. The TechScape website includes a set of FAQs and a small set of articles, but no formal knowledge base as far as I know. TechScape offers a good number of competitively priced shared hosting solutions for small and medium-sized enterprises. Their experienced, courteous, and highly responsive support team may be a major reason why many use their hosting solutions. You might want to join them, especially if you speak Indonesian. 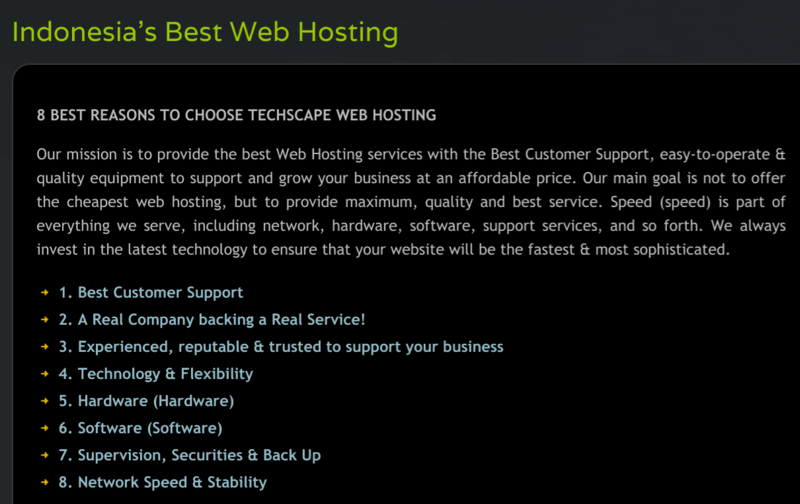 Wondering how TechScape stacks up against other Web Hosting companies? Enter any other Web Hosting company and we will give you a side-by-side comparison.